Cirrus Aircraft has announced an Interactive Flight Operations Manual (iFOM)which can be downloaded from the Apple iTunes store and used on an Apple iPhone, iPad and Apple computer platforms. 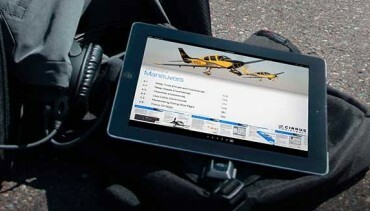 Essentially it’s a digital Pilot’s Operating Handbook (POH) for the Cirrus SR20, SR22 and SR22T aircraft. “Safety is in our DNA at Cirrus Aircraft, and as instructors, we are given the most important job of training and advising pilots to be as safe as possible,” said Travis Klumb, Director of Flight Operations and Training at Cirrus Aircraft. Information such as illustrated flight profiles, manouevres and checklist descriptions are easily accessible. Pilots are able to create personalised study cards and test their knowledge about pre-flight flow patterns. To insure pilots have the most current procedures, the iFOM also updates automatically, similar to applications on the iTunes App Store. With thanks to Flyer Magazine.